The personal injury lawyers at the Carr & Carr Attorneys At Law represent individuals who have been hurt or treated unfairly. At Carr & Carr, each lawyer fights for the rights of the individual. We are dedicated to representing individuals and their families. Beyond the commitment to the injured and the commitment to justice, Carr & Carr has a passion to give back to the community and get involved. Pat Carr has been a runner for many years and sees many homeless people during his runs around Tulsa. He decided to become more involved in the assistance of groups who help the homeless. 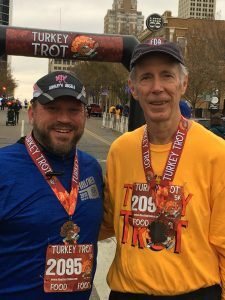 On Black Friday, November 23 at 8:30 a.m. Carr & Carr teamed up with Fleet feet to cohost and race in the Turkey Trot run in downtown Tulsa. This 5k and Fun Run were organized to help support the homeless. 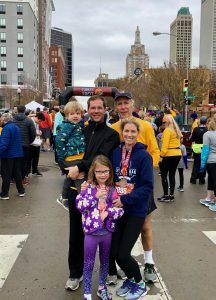 Carr & Carr donated $10 to the Tulsa Day Center for the Homeless for each pair of shoes donated at packet pick up the days leading up to the race. In true Tulsa fashion, the runners came through with strong donations. The Tulsa community donated 150 pairs of shoes and Carr & Carr extended their donation to $2,500. Pat Carr, Michael Carr, Liz Carr, children; Eleanor and Daniel Carr all participated in the race. Pat Carr won first in his age division and his granddaughter came in 3rd in her division. 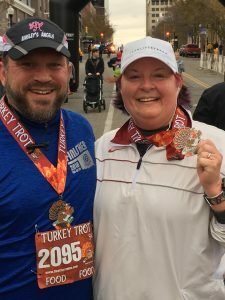 Additionally, Litigation Attorney, Chris Brinkley and wife Karen Brinkley participated, a remarkable effort on Chris’s part as he finished the race with a tear in a leg muscle. The Tulsa Day Center for the Homeless goes above and beyond for each individual who comes through the door by assisting clients with case management, healthcare, basic hygiene needs and resource education. For many, The Tulsa Day Center for the Homeless is the first step to starting a new and improved life. We are more than a homeless shelter. We provide a full spectrum of resources to help clients not only get back on their feet, but also become self-sufficient.